Nangwa wrote: The method is just a symbol to transmit the introduction. It can be perceived or experienced if the student goes beyond the symbol of the method of introduction. And thats the rub. It IS a shared experience/connection that occurs at that very moment between the teacher and students. A recording just wont cut the mustard because the moment has passed. Thats kind of the whole point. You are sharing an experience with the teacher via the methods he or she employs for the introduction. Like I said before, its difficult to explain. Its up to the student and teacher to make that connection and work with it directly. Letters are symbols to represent language, language is also a set of symbols to communicate thoughts. I don't see your thoughts and you don't see my thoughts. If I say the words you can't hear since you are not near me but as I write it down my thoughts eventually reach you in some form. Same goes on with symbols meant to convey the experience of realisation. The realisation itself is not communicated without some sort of expressions, and just as in case of words, the expressions don't lose their conveying nature if they are preserved in some way. To say that there is something is actually communicated without expressions means that there is actually no need for any form of communication, so the point of organising an event for transmission is meaningless. We can share an idea because we communicate in words or other means. Without words we don't share any idea neither can we decide if we share it or not. How is that different with realisation? Just because you have realised something - Dzogchen or anything else - if you don't tell me about it I won't be able to share it with you. The Samdhinirmocana Sutra says, "Thus, good son, the saints, being freed from language through their holy wisdom and insight in this regard, realize the perfect awakening that reality is truly apart from language. It is because they desire to lead others to realize perfect awakening that they provisionally establish names and concepts and call things conditioned or unconditioned." This points clearly to the relationship between the ultimate and the conventional and how it is the conventional that teaches the path to the ultimate. Same what Nagarjuna said. How then can the Dzogchen transmission communicate something without conventional means? I know you said it's difficult to explain, but perhaps it's not impossible. I feel like its been clearly explained and if it hasnt, resources that might make it more clear have been recommended. I'm not going to go into any more detail on it. Nangwa wrote: How then can the Dzogchen transmission communicate something without conventional means? I know you said it's difficult to explain, but perhaps it's not impossible. Who said that Dzogchen is not communicated through conventional means? Namdrol wrote: Who said that Dzogchen is not communicated through conventional means? Webcast happens in a video format. If it must be live and can't happen through a record there must be some extra beyond conventional means. That's what I'm inquiring about, that non-conventional part. Nature of Mind to nature of Mind… There is reflection. Reflection means instantaneous sparks of awareness. It might last. It might not last. Mind to Mind transmission means that the nature of the teacher’s mind and the nature of the student’s mind are identical in that moment. The noise produces the shock that creates the space in the mind for transmission to occur. So someone said before that space is not a concern, but time is an issue and for that reason you can't learn from a recording. This is a mind-to-mind transmission, right? So, what if we compare it to telepathy (for kicks). If you accept the idea that someone can mentally "speak" to you, would you expect also that they could put that on tape for you to listen to later? I know this isn't a brilliant point and has nothing to do with the three kayas and how transmission actually occurs, but if you think of it this way, it's not very hard to understand, imo. I got this from Aro website, which may or may not be suspect (I don't know), but this made sense to me. No, it just means that two people have to be in a process of communication with each other. 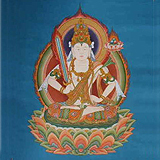 padma norbu wrote: Nature of Mind to nature of Mind… There is reflection. Reflection means instantaneous sparks of awareness. It might last. It might not last. Mind to Mind transmission means that the nature of the teacher’s mind and the nature of the student’s mind are identical in that moment. The noise produces the shock that creates the space in the mind for transmission to occur. Mind transmission simply means that the student understands the point of master is making at the same time the master is in that state. They are in the same recognition or understanding. There is telepathic communication or anything like this. Namdrol wrote: No, it just means that two people have to be in a process of communication with each other. In response to this (phone call) I said that at the time of a webcast (or even in a live session) the audience listens to the teacher and does not talk to him/her, so there is no communication between two people but communication from one person to the others. Of course, there is a room later for a Q&A part. That is communication between two people, a speaker and a listener. Communication: a process by which information is exchanged between individuals through a common system of symbols, signs, or behavior <the function of pheromones in insect communication>; also : exchange of information. In order for the teacher to communicate the state of Dzogchen to students doesnt require a conversation or anything else, other than the student being an active participant in the reception of the knowledge being communicated at that time and the teacher being skilled in communicating it. Namdrol wrote: That is communication between two people, a speaker and a listener. OK, I feel we're getting somewhere now. The question then is: why is it important that the teacher is in the same state at the same time as the student? Isn't the point of the whole thing that the student realises it? How does it make a difference if somebody else is also in that realisation? The student is not in the same state. The teacher shows it to the student. The student has a moment or two of recognition of that state. It is then up to the student to continue to work with it. (1) Aro: Mind to Mind transmission means that the nature of the teacher’s mind and the nature of the student’s mind are identical in that moment. (2) Namdrol: Mind transmission simply means that the student understands the point of master is making at the same time the master is in that state. They are in the same recognition or understanding. Last edited by padma norbu on Wed Jun 01, 2011 9:10 pm, edited 2 times in total. Nangwa wrote: The student is not in the same state. But the state is not shown by the teacher being in it. It is not even a state that can be grasped, how could then the experience itself be shown? It is usually shown by a little shock. OK, I feel we're getting somewhere now. Was I not saying this all along? Thats why the teacher uses methods and symbols to express to the students the state to be experienced. It doesnt work for everybody, at least not right away. Right. There are three transmissions. Oral, symbolic and direct. Without the first two you can't get the third. Though I heard that if you have really good connection and practice from previous lives it's possible through symbolic only. Pero wrote: Right. There are three transmissions. Oral, symbolic and direct. Without the first two you can't get the third. Though I heard that if you have really good connection and practice from previous lives it's possible through symbolic only. Since you mentioned earlier that you are "actually in the camp of people who believe that receiving a lung transmission should be possible through recordings", I was thinking that a recorded transmission would have to be symbolic or oral, while we're on the subject... agree/disagree? Don't see how it could be direct. Well yes, I didn't say otherwise. I was talking about lung transmission there.